Applied Ethics was founded in response to the reality of numerous major problems facing contemporary society, including war and systematic violence, global warming, extreme poverty, and the suffering cause by widespread and severe diseases and infirmities. While many people might look at these and see problems of engineering or economics, we see deep and pervasive ethical problems that require ethical solutions. Our work begins with the awareness of the place of injustice, ignorance, and selfishness and from there we seek effective responses. We see ourselves as a kind of think tank committed to action. Because all of these social problems constitute fields of concern for Applied Ethics, it has been our aim to be an organization with the capacity to manage multiple programs — as it were, a “holding company” that responds to the great issues of the day. For the time being, however, we are limiting our focus above all to the problem of war and systematic violence because these are such egregious violations of ethics and because where there is war, all other significant social problems — from environmental degradation to poverty and health concerns — grow worse. Where war reigns, the conditions for implementing solutions are all but eliminated. Although there are countless ways by which one could seek to advance peace, we have focused our efforts on education and in particular, education in which we draw on the help of tutors and teachers from around the world. In this way, we are acting on the mission of Pax Populi to be a true global people-to-people peacebuilding program. In support of this, we recently launched the “beta” or trial version of our online school Pax Populi Academy. In terms of technologies and systems, our Academy has a long way to go before it can match the best examples of online education, but we are making progress. We have taken initial steps to develop a more systematic curriculum that is conjoined with an integrated video conference program. In this way, instructors and students can speak with each other directly and in real time, while following along with prepared lessons. This permits us to reach out and connect instructors and students in programs that join intellectual advancement with a caring heart. Over the last few months, tutors and teachers from the United States, India, Bosnia and Herzegovina, and Trinidad have been working through our Academy with students in Afghanistan. We focus on English language learning because it is what we call a “gateway” skill — knowing English can open up many economic and social opportunities as it provides unparalleled access to information as well as the means for communicating with people in every countries. In this early phase in the development of Pax Populi Academy, we have the seeds of what we hope will become a more robust online school dedicated to a people-to-people approach to peace through education. Our work need not be limited to addressing the conflict in Afghanistan, but because Afghanistan remains in a state of war, our job there is not finished. It has always been our belief that it will be up to Afghans to bring peace to their own country. However, the world can and should lend a hand to those Afghans who can make a difference. 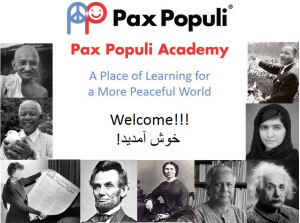 It is our hope that through our newly launched Pax Populi Academy, our efforts are becoming more effective… and if we are of service to some, the results will be of help to many… not only in Afghanistan, but around the world. War and systematic violence are a blight on humanity. We need to learn better ways. Education may be a slow road to peace, but it is also one of the strongest. It is one we trust and to which we are dedicated. Pax Populi Academy constitutes a step on a journey for a more ethical and peaceful global community. Because we face many important problems, many such steps are needed. It is a long journey, but we are on our way. Editor’s Note: As of June 2016, we have introduced a new version of Pax Populi Academy, informally know as PPA 2.0. By all accounts it constitutes a significant improvement over our previous online school.